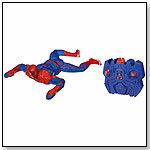 TDmonthly® - New Toys and Games: The Amazing Spider-Man Remote Control Speed-Climbing Spider-Man Figure from HASBRO INC. Kids can send their Spidey up the wall after villains with this fast-climbing figure. When kids point the controller at him and press the buttons, he climbs up and down, left and right, even upside down. 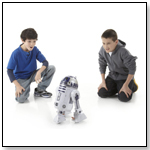 Put him on smooth, clean, dry surfaces such as windows and his mini-vacuums help him stick to the surface. Then guide the wall-crawling action with the controller.